The Republic of Sakha, or Yakutia, covers an area of approximately 3,103,200 square kilometers and lies in north-eastern Russia. Most of the area is covered with taiga, while over 40 percent of the republic’s territory lies within the Arctic Circle, including several islands in the Arctic Ocean. 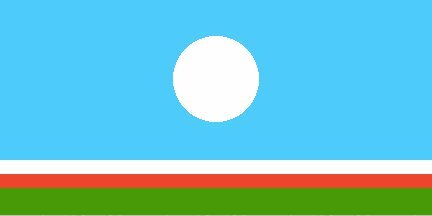 The population of the Sakha Republic is one million people, representing over 80 nationalities. Russians are the largest group, making up approximately half of the population, followed by indigenous Sakha-Yakuts who constitute a third of the population. Sakha is the largest autonomous republic of the Russian Federation. The region is rich in raw materials, which is why, to this day, it is one of Russia’s most important providers of mineral resources. Russian rule in the Sakha Republic began in the 16th and 17th century when the Russian Cossacks established a fort on the banks of the River Lena, which today is Sakha, Yakutsk’s capital. During Soviet rule in the 20th century, prison camps, or gulags, were built in this region and it served as a place to banish people, while its resources were exploited on a massive scale. Generally speaking, the situation of the local population improved during its UNPO membership. In 1992, a new constitution took effect in the Sakha Republic, which enshrined respect for sovereignty, democracy, the law system and the right to self-determination in the republic as part of the Russian Federation. The role of the Sakha, or Yakut, language gradually increased in public life and first steps were made to diversify the region’s industry and sources of revenue, thereby stabilising its economic situation in the late 1990s.